Progressive lenses, also known as multifocal or invisible bifocal lenses, give people the ability to see clearly at near, intermediate (computer), and far distances. Unlike bifocals, which have a clear line that separates the far-sighted and near-sighted vision, progressive lenses include the same benefits, but with no line. Patients often prefer the progressive lens for its cosmetic appeal, as others only see a smooth lens, rather than a clear line. Progressive lenses replace lined-bifocals for age-defying Appearance! Progressive lenses can also be understood as multifocal lenses. These lenses provide a gradual change in the power of the lens starting with distance vision and transitioning smoothly to near vision. With advanced in progressive lenses designs, a person has the ability to see across the room in a distance zone, look ahead to vie a computer in the intermediate zone, and by dropping their gaze are able to read and do fine work in a near zone. Each company has various designs of progressive lenses. When fit with a good design and adjusted property it can be very easy to adapt to today’s modern digitized progressive lenses. Your eye care practitioner will work closely with you to ensure that you are fit with the best progressive lens design based on your visual needs, eyeglass style, and ultimately your lifestyle. Progressive lenses eliminate some of the most annoying problems caused by line bifocals, such as the image jumping when changing your field of vision. When you are fitted with a progressive lens for the first time you may notice slight discomfort as your eyes adjust. 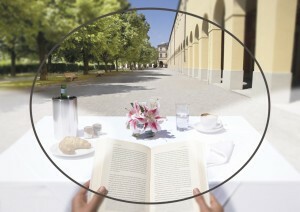 Minor discomfort may be caused due to the small distortions in the peripheral part of the lens. A short adaption period will be necessary, however, you will quickly find comfort with the new lenses. The adaptation period may vary from minutes to days depending on the individual. With recent technologies, progressive lenses are continually improving with the goal of reducing the peripheral distortions, as well as making the distance, intermediate and near zones wider and more accessible. As a result of these modern advancements most first time progressive wearers are comfortable with lenses almost immediately. Family eye care is committed to serving our patients by offering digital progressive lenses from world’s best progressive lens manufacturers. We aim to find products that offer the best vision, all the while considering the price point of these lenses. By offering excellent progressive lenses we hope to improve your lifestyle by ensuring your lenses meet your visual demands. Come visit our optometrist assistants and student optician to help you pick out new glasses or simply to adjust your current glasses!